I expect to release another Poll Roundup later this week, but have decided to put out something else I have been working on for a while first. This is another post about general historical trends in federal elections concerning crossbench wins (see also Independents Seldom Replace Other Independents). Recently on Twitter, Peter Brent noted that the crossbenchers who had gained seats at the last few federal elections had all done so either by winning vacant seats or by defeating unpopular incumbents. I looked at this theme more broadly and thought it was worth posting some expanded results going further back. In federal elections, House of Representatives seats are won and lost between Labor and the Coalition frequently, and if a seat is close and the swing is on, then a personal vote only goes so far. Incumbents who have had trouble-free terms are quite often victims of a national swing to the other side. However, they are rarely defeated by anyone else. Independent and moderate crossbench candidates should have an advantage in some ways. In seats that are "safe" on a two-party basis there are voters who will not vote for the other side. This isn't necessarily about policy, and is often more about a political culture with a class-based aspect to it. A rural Nationals supporter often won't consider voting Labor, but they might vote for the right independent. A working-class voter in Glenorchy, Tasmania, won't consider voting Liberal, but they might well vote for Andrew Wilkie. The problem for these sorts of candidates is getting their vote high enough to make the final two. Recently we've seen a string of independent candidates announcing they will run in normally safe seats and at times the reaction in some parts of the media, and on social media, has appeared to be excessive. On account of Kerryn Phelps' win in Wentworth - a narrow win in a historic by-election by an already high-profile candidate - there seems to be an expectation that almost any independent claiming to be of the "sensible centre" and making noises about climate change will be a chance against any Liberal they wish to take on. It might be we're on the threshhold of a historic disruption in more than a few "safe" Liberal seats, but national polling betrays little evidence of it at present. The combined aggregated polling vote for candidates excluding the majors, Greens and One Nation currently runs at about 9%, perhaps a point higher than when Malcolm Turnbull was Prime Minister. If this was a major inner-city force I would expect it to be resonating in many electorates and showing up much more obviously in national polling. It's not even clear that these minor shifts have anything to do with the supposed indie surge; they may be caused by Clive Palmer's United Australia Party starting to take the odd vote off One Nation. The following is a list of crossbenchers elected since 1950, with some details of their circumstances (click for larger clearer version). * Five already held their seat, having previously been elected as a major party candidate. All of these were deselected or expelled from their party, or resigned from it. * Four were first elected (in one case ineligibly) at by-elections for vacant seats. * Another four were first elected at general elections for vacant seats. * The eight elected when seats were vacant typically replaced incumbents who had served long terms before retiring. The average length of tenure of the retiring MPs in these cases was over 15 years, with only one under 10 years. The replaced incumbents included two ex-Prime Ministers who had quit politics after being removed by their parties. * Of the remaining six, one (Pauline Hanson) appeared on the ballot paper as a Liberal. Her disendorsement would not have been known to all voters. * Only five of the 19 crossbenchers were first elected by defeating a major party incumbent while not being listed as a major party candidate. Furthermore of those five, one (Tony Crook) is only tenuously classified as a crossbencher at all, running for a party which was affiliated with a Coalition partner (the Nationals) while not technically being a Coalition partner at the time of his win (that later changed). Crook, Rebekha Sharkie and Cathy McGowan all defeated incumbents who were noticeably controversial. As Peter Brent notes, this classification is a little prone to post-hoc revision. Crook's opponent Wilson Tuckey was overdue for retirement as well. A line might be drawn between cases where the incumbent became an election issue in the seat themselves, and cases where they weren't. Only Tony Windsor and Ted Mack won election to federal parliament as crossbenchers by beating incumbents who were not considered to be liabilities. Both Windsor and Mack were successful state politicians prior to their victories. Windsor defeated one-term National Stuart St Clair who had in turn replaced 35-year incumbent Ian Sinclair. Mack defeated 10-year Liberal incumbent John Spender, who had not before faced a serious challenge. All the other crossbench winners mentioned had a leg up. It was a by-election, or there was no incumbent, or they were the incumbent, or the incumbent was on the nose. How many 2019 crossbench targets are soft? Several seats that are being talked about as possible crossbench gains at this election can be considered soft in some of these ways or other (which isn't to say all or even any will fall, just that there is the potential for a big crossbench seat haul without anything unprecedented happening). * Cowper: Cowper is being vacated by 18-year Nationals incumbent Luke Hartsuyker. It is also a special case because the main independent trying to win it, Rob Oakeshott, has already sat in parliament as a crossbencher before. * Higgins: Higgins is a Green target seat on a modest margin and being vacated by 9-year incumbent Kelly O'Dwyer. * Macnamara: The new seat of Macnamara will be vacant and is a Greens target seat following the retirement of 20-year Labor incumbent Michael Danby. * Mallee: Mallee is vacant following the retirement of Andrew Broad, though Broad has not been as long-serving as in previous cases where crossbenchers have picked up vacant seats. The recent win of the state seat of Mildura by an independent has increased interest in possible independent challenges in this area, though it is a challenging electorate to campaign across the whole of. * Warringah: Tony Abbott is certainly controversial both in terms of his political positions and his political behaviour. If Abbott loses he can easily be classified alongside Tuckey, Mirabella and Briggs. The new notionally Labor Canberra seat with no incumbent is also being targeted by the Greens though I'm not sure anybody else much shares their optimism about it. As for New England, Barnaby Joyce's recent career is a trainwreck, but he doesn't seem to be attracting serious independent threats at this stage. His thumping by-election win might have a bit to do with that. As against the above, the crossbench itself has a vacancy in Indi, which is therefore a softer target for the Coalition parties than it otherwise would have been. Is Flinders a soft target as I've defined it? I don't really think so, though I could be wrong. Greg Hunt has been controversial from time to time, but not spectacularly so. It will be interesting though, because an MP quitting her party and then running against an MP from the same party in their own seat is a pretty unusual event. Other potential crossbench challengers are taking on harder cases. Greg Hunt in Flinders has been controversial now and then, but it's a stretch to assume an election in his seat is going to be all about him. The novelty there is that his challenger, Julia Banks, is an independent who quit the government in another seat. When it comes to independent challenges against Josh Frydenberg in Kooyong, or Jason Falinski in Mackellar, the opponents are so much not the part of the Liberal Party's problems that the indie wave materialised to fight against, that the challengers almost have to apologise for taking them on. Brisbane is another Greens target seat that falls into the harder category assuming Trevor Evans recontests. Grey was a close race between the Liberals and NXT last election and the defeated NXT candidate is recontesting as a Centre Alliance candidate (though there is doubt about how well the party's brand will transfer to the new name.) And these days, pretty much any Nats rural seat could have a "Voices of ..." grouping trying to knock off the incumbent. By-elections are shown in grey. 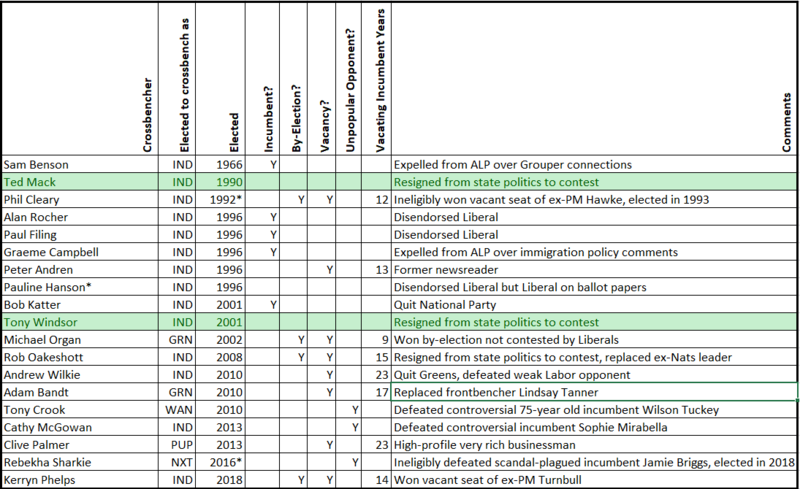 A few notes: firstly in Calare 1996, the defending Labor Party didn't even make the 2CP, so I have estimated their 2CP against Peter Andren, applying flows between Andren and Labor from the excluded Liberal candidate to the Nationals' candidate. Secondly, the Nationals got a primary vote swing to them in losing New England to Tony Windsor in 2001, but that was because the 1998 election in that seat was a three-cornered contest. Had it not been, I estimate the Nats primary in 1998 would have been 44.1%, for a 5.2% swing against them in 2001. Incumbent major parties have lost at general elections from primaries as high as 58.5% and 2PPs as high as 66.6%, and at by-elections from primaries as high as 62.3% and 2PPs as high as 67.8%. They have lost with primary vote swings as high as 22% at general elections and 29.3% in the case of Lyne, and 2PP-to-2CP shifts as high as 21.2% at a general election and 32.5% at a by-election. So there is nothing remotely far-fetched about the idea that Tony Abbott, with a 2016 primary of 51.7% and 2PP of 61.1%, could be beaten by an independent. If Abbott lost narrowly, that would be an unremarkable or even modest example of the sort of swings required to do it. There have been multiple general election cases of incumbents doing about 20 points worse against a prospective crossbencher on 2CP than they did on 2PP against a major party. 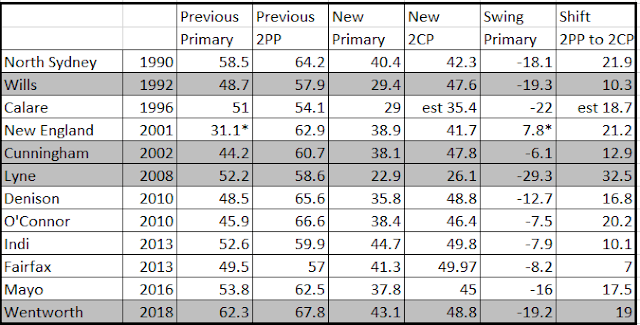 Indeed, crossbenchers are more likely to win in seats where large 2PP-to-2CP shifts are needed to win to do it. These tend to be seats where the parties are widely enough split that it is easy for an independent to get into second, at which point if the incumbent's primary is low enough (typically sub-45) the preference flow can do the rest. "Safe seat" status just isn't much chop in saying how well an incumbent can hold off a third-party challenger. If their seat is one that has an aversion to voting for the rival major party, but no aversion to voting for an independent, then the margins of past contests are completely irrelevant.